Our current students are engaged in a wide variety of activities supported by the university. Here are some inspiring examples. writing, acting and film production. 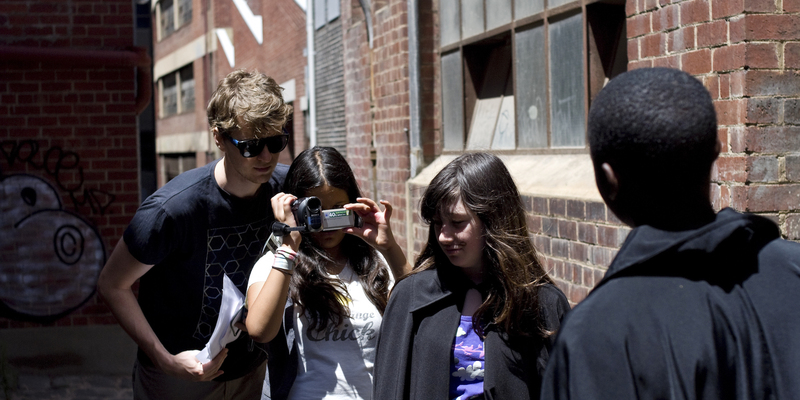 Originally conceived as a two-day workshop to support young people in Carlton and funded by a University of Melbourne $5,000 DREAMLARGE Grant, Shakespeare in Community has grown well beyond the expectations of four friends who shared a love of Shakespeare. Building on the success of the first small workshop in September, the team went on to run an extended five-day workshop in January, the success of which led to a flood of requests to deliver the program to older audiences, migrant audiences and geographically spread audiences. Motivated to inspire more young people through this wonderful program, the team is now working to adapt and deliver the program for these different audiences. Recently they began delivering it as an after- school program in community centres in Noble Park and Flagstaff Gardens, in turn creating even more possibilities for this innovative program. For team leader Stella Loong, the level of interest in the program is extremely pleasing and she sees a pressing need to deliver it to many more audiences. There are so many young people who would love and benefit from this program – particularly those from different cultural backgrounds who cannot tackle Shakespeare on their own", said Stella. Stella and her team are also hopeful that the Shakespeare in Community workshops will inspire participants to succeed in other facets of life. "By supporting and encouraging these kids, as we are supported and encouraged at the Law School, we hope they will learn that they can achieve great things", explained Stella. has already had several groups submit their films to the St Kilda Film Festival. Examples of the films made so far provide a brilliant showcase of the depth of talent and creativity often found in the young. One film plays out the death scene from Romeo and Juliet in a graffiti-lined bluestone alley with the players dressed in street clothes. Another places the witches' scene from Macbeth in a bathroom – using a communal sink as the cauldron. Perhaps the most poignant aspect of the Shakespeare in Community program is that it ensures that the Bard's work will be known and loved by people who could have passed it by. Melbourne Law Students Jesse Smith and Denis Cairney sought to bring about the end of charity by offering a hand up, not a hand out. SEW Bags (Supporting + Empowering Women) is the resulting enterprise, creating employment opportunities for HIV+ women in Arusha, Tanzania. The project employs women to create tote bags crafted from fully recycled materials. This acts as a vital stepping stone to financial independence for both the women and the community. While making these bags, the women learn valuable business skills and are paid a fair wage for their work. Earlier this month, the SEW project was bolstered with the announcement that bookstore Readings would begin to stock the handcrafted totes throughout its stores. Founding member Jesse Smith was elated with the reception of the bag at the Readings distribution launch. "Over the last month, demand for the bags has been huge. This new avenue of distribution has ensured that we can continue to provide employment to HIV+ women over the next year." The sixth year Arts/Law student said, "from a philosophical perspective, it is exciting to see Fair Trade products succeed in the mainstream marketplace." This article originally appeared in MLS News, Issue 3, May 2010.